Dr Pepper makes it easy to host the perfect summertime party! 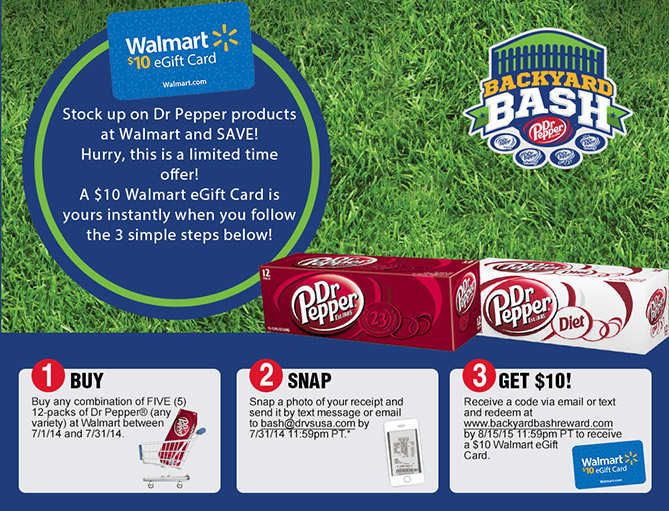 For a limited time, buy five 12-packs of your favorite Dr. Pepper and receive a $10 e-Walmart gift card. Look for more details in-store or check out drvsusa.com/bash. BUY: Five (5) 12-packs of Dr Pepper at Walmart. SNAP: Submit an image of your receipt showing qualifying purchases to TPG. RECEIVE: An e-$10 Walmart gift card – within 10 minutes after qualifying purchases have been validated!